Be the first to share your favorite memory, photo or story of EVERETT. This memorial page is dedicated for family, friends and future generations to celebrate the life of their loved one. 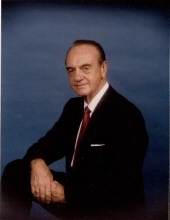 EVERETT EBINGER HALL, age 95, of Republic, Missouri, passed away at his home on Tuesday, January 1, 2019 at the age of 95 years. He was born July 7, 1923 in Aurora, Illinois, to Robert E. and Florence Mattie (Henrietta) Hall, who precede him in death. Everett was united in marriage to Fern Zella (Blair) Hall on August 5, 1987. With this union, his family grew with having two sons, three stepsons, one daughter and one stepdaughter. He was a World War II veteran, serving the Army from 1943 to 1946. In his career Everett was a manager for JC Penney’s for thirty-three years. He was an avid sports fan, especially loving the Chicago Cubs baseball and the Chicago Bears football since 1933. Everett also enjoyed golfing and fishing. After retirement, he lived in Florida until he moved to Republic, Missouri, eight years ago. This is when he came to be at First Christian Church and loved being active with his church family. Everett is preceded in death by one sister, Marjorie Beal. He is survived by Fern, his wife of thirty-one years; daughter, Barbara (Dave) Albosta; sons, Michael (Pat) Hall and Robert (Joanne) Hall; stepdaughter, Sherry (Jerry) Burbridge; stepsons, Glen (Stenna) Tilman, Dennis (Carol) Tilman and Mark (Jeannine) Tilman; grandchildren, Michelle, Meredith, Melinda, Melissa, Jordan, Tracy, Charlene, Maggie, Matt, Michael, Bryan, Angela, Steven, Kelly, Heather, Amy, Justin, Katy, Nathan, Luke, Drew, Mathew, Jenn, Megan, Matt and 36 great grandchildren. To send flowers or a remembrance gift to the family of EVERETT EBINGER HALL, please visit our Tribute Store. "Email Address" would like to share the life celebration of EVERETT EBINGER HALL. Click on the "link" to go to share a favorite memory or leave a condolence message for the family.